The Annual Conference mobile app is available in the Apple App Store and Google Play Store. Sign in or create an account and build a customized schedule, connect with other attendees, view maps of the New York Hilton Midtown, browse exhibitors in the Book and Trade Fair and the Cultural and Academic Network Hall, view local restaurant recommendations and discounts, and much more. Simply search in your phone’s app store for “CAA 2019” and download the app. New this year, if you created an account on the web schedule and built a customized schedule, it will sync with your mobile app once signed in. January 22: Hotel reservations at the Sheraton must be made to receive the conference discount rates. January 23: Hotel reservations at the Hilton New York Midtown must be made to receive the conference discount rates. The following organizations have generously opened their doors to CAA conference attendees. 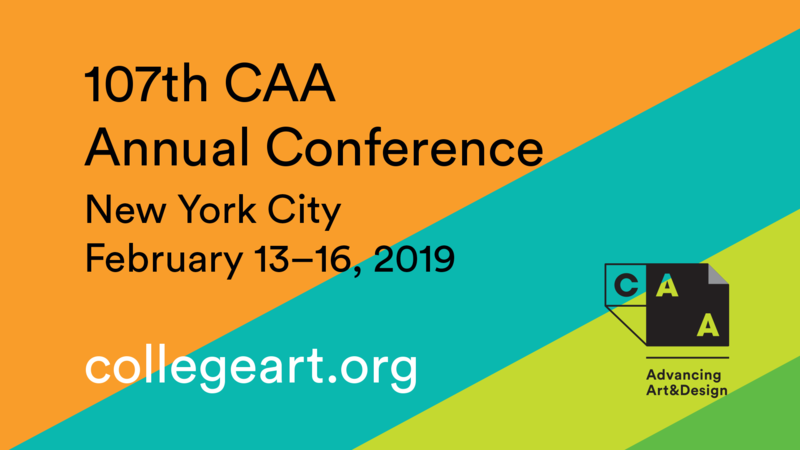 Present your CAA 2019 badge upon entry during the days and hours listed below for free or discounted admission. For information about the museum or cultural center, please visit their website listed below. Discounted Admission details: During the time of the conference, the museum will be in between exhibitions. Only one gallery room will be open for viewing, and admission will be by donation/pay-what-you-wish. All CAA conference attendees will be able to skip any queues to the museum when presenting their badge. Complimentary wireless service is available in all public areas, sessions rooms, and exhibits halls at the New York Hilton Midtown. This service is suitable for email and web browsing but may not be for streaming media or other high-capacity use. Complimentary internet service is available in guest rooms at the New York Hilton Midtown and the Sheraton New York Times Square. The Hilton’s full-service business center, located on the 2nd floor, provides copy services, faxing, shipping, and computer access for email. Business hours are Monday through Friday, 7:00AM-9:00PM; Saturday and Sunday, 7:00AM-7:00PM. CAA is pleased to announce onsite child care for children 6 months–12 years old, in partnership with KiddieCorp. KiddieCorp is in its thirty-third year of providing premier children’s program services, and enjoys a long-time partnership with the American Academy of Pediatrics. Outside of these hours, hotels maintain a list of other licensed, bonded agencies offering child-care services. Contact your hotel’s concierge for additional information. The Hilton New York Hotel Midtown has several dining options. Overlooking the lobby, the Lobby Lounge is your spot to rendezvous. Enjoy exceptional wines, cocktails, and light fare as well as terrific people watching. Hilton’s new concept restaurant, Herb N' Kitchen, features seasonal salads, artisanal sandwiches and brick oven pizzas. A barista zone offers specialty coffees to enjoy either in the restaurant or on the go. Discover the ultimate in sophistication in the fantastic setting of Bridges Bar. Celebrate the romance of Manhattan's Seven Bridges while sipping your favorite cocktail at the spacious bar. Enjoy some of the best martinis in town or choose from our ever-changing selection of fine regional wines in a welcoming atmosphere. The Sheraton New York Times Square Hotel’s Hudson Market Bistro, located on site, serves breakfast, lunch, and dinner in a casual setting. Breakfast includes omelets and pancakes, while lunch and dinner deliver an extensive menu of salads, sandwiches, brick-oven pizzas, and full entrees. There’s also a kids’ menu with pizza, chicken tenders, macaroni and cheese, and the like. The Lobby Lounge is surrounded by plenty of cushy chairs and cozy loungers. Order a drink for yourself and some appetizers for the kids. This spot is convenient when you’re waiting to check in or when you’re in search of a nightcap. A room has been set aside for conference participants with lactation needs. Please contact Mira Friedlaender, manager of the Annual Conference, at mfriedlaender@collegeart.org to receive room information and to arrange access. A gender inclusive restroom is available on the second floor, near the entrance to Rhinelander North, in the New York Hilton Midtown. CAA is committed to providing access to all individuals attending the conference. To make a request for special accommodations ( e.g., sign-language interpretation, large-type print materials, transportation ) please contact Paul Skiff, assistant director for Annual Conference, at pskiff@collegeart.org or 212-392-4413 by December 14, 2018 in order that your accommodations may be arranged and scheduled in time for the conference. Arrive early at registration on your first day. Registration is located on the 2nd floor Promenade in the New York Hilton Midtown. Lines can be long—even for those who pre-registered—so plan to arrive at least thirty minutes before your first session or event begins. Even better, you can pick up your materials on Tuesday evening, February 12, from 5:00 to 7:00 PM. You can find floor plans in the program or on the free conference mobile app to help you get oriented. Charge your laptop and your cell phone every night, and remember to pack your charger in your bag. Dress in layers. The temperatures in conference session rooms can fluctuate. Bring healthy snacks and keep a refillable water bottle on hand. Post on social media using #CAA2019. If you’re heading to a session of interest or enjoying a particular event, let other people know about it. Track the hashtag on Instagram to see a stream of conference photos. Keep track of your conference badge. Your badge allows you admission to all sessions, the Book and Trade Fair, and various museums around the city. Don’t lose it—a replacement costs $25! Check times closely. The conference mobile app lists updated times and locations for all sessions, events, workshops, receptions, and exhibitions as well as cancellations. Session-hop. You don’t have to stay for the full length of a session. The speakers for each session are listed in the conference app and in the Conference Program, in chronological order. All sessions are 90 minutes in length. If you calculate 15 minutes a talk for a 4-person panel, you can estimate when to head to another panel. If you play “musical sessions,” grab a seat near a door so you can easily slip in and out. There is a thirty-minute break between sessions. Give yourself enough time to move from session to session—especially since you may have impromptu conversations with folks you meet in the hallways! Laptops and cellphones. You can use your laptop or cellphone during a session. Typing notes during a talk is okay; so is tweeting. Just be mindful of your neighbors and respectful of the presenters. Please silence your phone during sessions and share your tweets using #CAA2019. Ask a question. Chairs usually reserve time at the end of the session for audience questions. Write down your question in advance and make sure it’s related to the discussion. Don’t forget to state your name and your institutional affiliation so that people can remember you. If you’d like to respond to the presentations with your own comments, talk to a speaker afterward and get his or her email. Introduce yourself to the person sitting next to you. A big part of attending the conference is networking. Before the session begins is a great time to introduce yourself and make a connection! Visit the SEPC Lounge. It is a place where you can network and relax, as well as find more information about CAA and the Student and Emerging Professionals Committee. Get involved! CAA Professional Committees and discipline-specific affiliated societies regularly host their own sessions. Attend these talks and introduce yourself to their representatives afterward. Partner with friends or colleagues to cover sessions happening at the same time. It’s not possible to do everything, so decide in advance who will attend each session and take notes for each other. You could then meet after the sessions, or wait until you get home, to regroup and discuss. Don’t spend all your time with your friends. You’re at the conference to network, so leave your comfort zone and set a goal to meet at least two new people every day. Get their business cards and jot down where you met them and what you discussed so you’ll remember later. Attend the Meet and Greet. First-time conference attendees, those interested in learning more about what the conference has to offer, and anyone who has arrived early are invited to attend an informal Meet and Greet on Tuesday evening. A cash bar will be available. The Meet and Greet will take place on Tuesday, February 12, 6:00–8:00 PM, 2nd floor Promenade. Discounts at the Book and Trade Fair. Saturday offers the biggest discounts on art books and supplies. Many Book and Trade Fair vendors offer reduced rates—anywhere from 10 to 50% off—on books, art supplies, journals, and other materials on the last day of the fair. Some publishers even allow conference attendees to reserve copies of books in advance of the Saturday sale—ask a booth representative how you can do this. Some Book and Trade Fair vendors extend their discounts up to a month after the conference. Collect product catalogues and paper order forms from them and make sure to use the proper discount code when ordering later. Mail your flyers, swag, and books from the Book and Trade Fair to your home address on the last day of the conference if you are traveling by plane. This will prevent your luggage from breaking your airline’s weight limit. Alternatively, bring a larger suitcase with more room or an extra carry-on bag for your purchases. Follow up with your new contacts. Send an email to those you’ve networked with to follow up on a question or discussion. Connect with your new contacts on social media and extend your professional network. Complete the post-conference survey. About a week after the conference ends, CAA emails a post-conference survey to all registrants. Please take a few minutes to let the association know about your experience. CAA carefully reviews survey responses as it plans future conferences and events. Submit a proposal for CAA's next Annual Conference in Chicago, February 12—15, 2020 During the 2019 conference, think about a proposal for a paper or presentation you’d like to submit or speak with colleagues about a session you’d like to put together. In early March 2019, CAA will open the 2020 Call for Proposals. If you’d prefer to submit a paper or presentation to a session that has been accepted for the 2020 conference, look for the 2020 Call for Participation in the summer. After reading the session descriptions, find a panel to which you’d like to submit. Watch the CAA website and CAA News for information about the conference proposal submission process for 2020! Join us as a conference assistant in 2019! CAA encourages students, emerging professionals, and others in the New York City area to apply, particularly those with strengths in hospitality and technology. CAA employs assistants throughout the conference from Wednesday, February 13 to Saturday, February 16. Assistants provide essential support to ensure a successful conference: welcoming participants and attendees, helping answer questions and monitor activities, plus troubleshooting problems that may arise. Assistants ensure that session rooms and other venues are prepared prior to the start time, help participants, assist with AV, and communicate with on-site AV technicians as needed. Assistants also monitor session rooms, conference badge and ticket adherence, record attendance numbers, and help prepare for the next session or event. Assistants working in the registration area direct attendees to check-in areas, answer questions about conference, CAA membership, the CAA 2019 app, and support CAA staff. Successful applicants will be friendly, communicative problem solvers who are comfortable in a customer service role, able to navigate crowds quickly as well as being patient and flexible in a busy environment. Experience with projectors and both MAC and PC laptops is essential. Familiarity with New York City and the subway is preferred. CAA membership is encouraged but not required. Students should check to see if their schools and universities are CAA institutional members as institutional membership now includes the benefit of specially discounted individual student memberships. Assistants are paid $12 per hour and receive complimentary full-conference registration. Assistants are required to work a minimum of 20 hours (or a maximum of 32 hours) over the four days of the conference. Attendance at a one-hour (paid) training meeting Tuesday night, February 12, 2019, is required. Candidates must be US citizens or permanent US residents and able to fill out a W-9 employment form. The deadline to apply to work at the conference has passed. Questions? Contact Mira Friedlaender, manager of the Annual Conference at mfriedlaender@collegeart.org or 212-392-4405. Thank you for your contribution to the CAA Annual Conference. In this section, we have provided information to help you organize your session. Please direct questions about participation to session chair(s). For general conference-related questions, please contact Mira Friedlaender, manager of the Annual Conference, at mfriedlaender@collegeart.org or 212-392-4405. All session participants must be current individual CAA members through February 16, 2019, to be included in the Conference Program and listings. This includes session chairs, speakers, and discussants, as well as CAA committee or affiliated society members. Institutional membership does not qualify as individual membership. CAA members at the Tier Two level planning to attend the Annual Conference are encouraged to upgrade to Tier One, which, when combined with the discounted conference registration, will provide the greatest value. For any questions regarding CAA membership, visit our membership page or call 212-691-1051, ext. 1. All session participants (chairs, speakers, discussants), including those in CAA professional committees or affiliated societies, must register in order to take part in the conference. Participants may take advantage of early registration online to receive the best rate. Tier One membership is designed for those who plan to attend CAA’s Annual Conference with a 55% discount on early registration, which will remain open through December 16, 2018. We encourage members to register for the full conference to take advantage of the entire program. Full conference registrants receive a badge allowing access to all on-site programming, as well as museums offering free admission. To participate in a session, members must have a conference badge, a day pass, or a single time-slot ticket. Single time-slot tickets and day passes are only sold on site at registration. Registration lines can be long, so plan to be there at least 90 minutes before your session begins. The following AV equipment is NOT included: Q&A microphones, Mac adapters (“dongles”), spare USBs, computers, and slide projectors. Please bring your own laptop for your presentation. Computers are not supplied by CAA, the New York Hilton Midtown, or the AV Services provider. Mac users MUST bring an adapter that is compatible with VGA or HDMI projector connections. Check your adapter at support.apple.com/en-us/HT201853. PC users without VGA or HDMI ports should bring a USB to VGA or HDMI connector. AV equipment requests that are not part of the standard set up are subject to additional fees that are not the responsibility of CAA. Please email Mira Friedlaender, manager of the Annual Conference, at mfriedlaender@collegeart.org, for a price quote by November 5, 2018 and indicate “AV equipment” in the subject line. Late requests will not be honored. It is ideal for all presentations to be loaded onto one computer and tested prior to the session. Bring fully charged laptops, dongles, and USBs containing the presentation visuals to the session. Please check in with an AV technician at the Speaker Ready Area if you need to test equipment. If your presentation includes audio and/or video media, please download and test it before your session begins. Make sure that the videos are readily available on your desktop or inserted into your presentation. We do not advise using web links. We suggest that you arrive at the session room at least 20 minutes early to test your equipment and presentation. Session participants are required to present in person. Please discourage speakers who wish to participate in your session remotely. Although session rooms are equipped with Wi-Fi, we cannot ensure that remote participation can occur without connectivity or quality issues. Chairs are responsible for making logistical arrangements (i.e., AV, room setups, signage) for sessions held at off-site venues. CAA is not responsible for these arrangements. The Annual Conference Committee created the conference schedule building a balanced program with as little content overlap as possible. The result is a conference program reflective of the vast areas of specialization and expertise of CAA members. Every effort was made to honor the scheduling requests and conflicts noted at the time of submission. Scheduling assignments were emailed to session chairs in August. It was the chair’s responsibility to review the date and time, inform the participants of the schedule and room assignment, and inform CAA of scheduling conflicts. Please check the schedule and notify your session chair immediately if you cannot attend your session for any reason. Individuals must participate fully in person. Due to the number of sessions and the space available, CAA cannot rearrange the conference schedule or move sessions at this time. Due to publication deadlines, all session content was considered final as of September 14, 2018. No session or paper title changes will be made after this deadline. All speaker and abstract title changes were to be made by the session chair or designate only. Any speaker cancellations that occur must be communicated with both your session chair(s) and Mira Friedlaender, manager of the Annual Conference, at mfriedlaender@collegeart.org. Names: CAA does not list titles or honorifics (i.e., Prof., PhD, Esq., etc.) or positions (i.e. Assistant Director, Chair, Department Head, etc.). Chairs should consult with participants if they are not sure of spelling. Institutional Affiliations: official institution names, as they appears on the institution’s website or mission statement, are used. Acronyms or colloquial titles ( The Met, CUNY, etc.) are avoided. CAA only lists one affiliation per person and defaults to the first listed in the original proposal. Paper titles: Titles will appear in italics before each speaker name. Paper abstracts: Firm 250-word limit; words over 250 will be cut. Style: CAA uses serial commas; spells out numbers; and uses American spelling, not British. CAA follows the styles set forth in The Chicago Manual of Style and spelling from Webster’s 3rd or 4th International Dictionary. CAA produces Abstracts as a record of papers and presentations made at each Annual Conference. This digital publication contains summaries of session presentations as submitted by chairs and speakers by September 14, 2018. Abstracts 2019 will be available to all conference registrants via PDF download. A hard copy will not be available. Following the conference, Abstracts 2019 will be available for purchase: $30 for CAA members and $35 for nonmembers. For more information and to order, please email Roberta Lawson, CAA office coordinator, or call 212-392-4404. Discussants do not submit or have abstracts published, but their names and affiliations are listed with their sessions on the conference website, and in the final printed and online Conference Program as well as Abstracts 2019. For planning purposes and quality control, session chairs may require that speakers submit the full text of their papers/presentations no later than January 1, 2019. The requirement of paper submission is at the discretion of the chairs as these January submissions enable them to review the content and length of the actual presentation. Papers should be sent directly to chairs. Do NOT send your paper or email to CAA’s office. All session chair(s) must be in contact with participants before the conference to reach an agreement regarding time allocations and order of presentations. Whatever form your presentation takes, we recommend that all participants use a timer while practicing their presentations to be sure they do not go over their allotted time. All sessions are 90 minutes long. Engaging session formats (other than consecutive reading of papers) are highly encouraged by CAA. Discuss these options with the session participants prior to the presentation. CAA branded slides for presentations: Some session chairs may wish to have “place holder” slides within their presentations for the beginning or end of their sessions. The CAA branded slide is available to download here. CAA asks that the order of speakers follow the order in which the chair listed the speakers in the final submission (i.e. speaker 1, speaker 2, etc.). This speaker sequence will be used in the Conference Program, online and in print; at the conference, please do not change the published sequence of speakers, as many attendees “session hop” and come to hear a particular presentation. CAA does not require or suggest a minimum amount of time for introductions, presentations, comments, Q&A, but we highly recommend that chairs block out time to include audience participation. Discussion is what makes the Annual Conference exciting. Even if your session begins late, it must end on time. Sessions rooms are busy all day; session chairs going over their 90-minute allotment will be asked to vacate the room so the next session may begin on time. The 30 minutes between sessions is designed to allow ample preparation time for the next session; please move any ongoing discussion into the hallway or another public space. Names and affiliations printed on conference registration badges are not connected to your name and affiliation as printed in the Annual Conference print publications or website. Badges are produced and printed by the CAAMembership department directly from information you entered into the CAA database upon joining, renewing your membership, or registering for the conference. We know how your name and affiliation appear on your badge is important to you; please review your CAA membership account information online here. If your name or affiliation needs to be updated, you must contact member services, at membership@collegeart.org, or 212-691-1051, ext. 1, by December 14, 2018, and update your “badge information.” This will ensure that your name appears as you wish on your badge and in the conference Directory of Attendees. Sessions are not recorded by CAA. If you wish to record your own session, you must obtain permission from all speakers who may speak and inform the room at the start of the session that you will be recording so people who do not wish to be recorded may leave. All speakers own and maintain copyright to the work they present at the conference and you may not publish their words without proper permissions and citations. Any later use of content presented at the conference must be attributed to the appropriate author and cited with paper and session title as well as the date of the conference. If you believe your work has been stolen or plagiarized by some other person, we encourage you to contact us so that an investigation might be conducted, and, if appropriate, we may contact the involved parties and publishers involved. Through conference attendance, I hereby grant permission to CAA to i) photograph, film, or otherwise record my image and voice at the above event or location and ii) use, reproduce, perform, display, distribute, and create derivative works of any resulting photographs or recordings, as well as my name in connection therewith, in any media now known or as may be later developed and to authorize its agents or representatives to carry out any of the foregoing on CAA’s behalf. I acknowledge that CAA owns all rights to such photographs or recordings. I waive: i) any right to inspect or approve any use of the photographs or recordings or any works incorporating them and ii) any and all moral rights in any such uses. I understand that I will not receive any compensation from CAA or any other person arising from or related to the use of such photographs, recordings, or works. I hereby release CAA and its Board of Directors, officers, employees, contractors, volunteers, representatives, or agents from and against any claims, damages, or liability arising from or related to any use by any of them of such photographs, recordings or works, including but not limited to claims of defamation, invasion of privacy, or rights of publicity or copyright infringement, or any misuse, distortion, blurring, alteration, optical illusion or use in composite form that may occur or be produced in taking, processing, or producing materials incorporating them. During conference hours you are welcome to run through your session, go over session specific procedures or timing with your speakers, or strategize with your co-chairs in this room with minimal distractions. CAA is not responsible for speaker notes, computers, or personal belongings left unattended in the room. 8:00–8:30 AM—optional AV orientation meetings are held Wednesday through Saturday. An AV technician will be available at these meetings to assist you and answer any questions you may have about the AV equipment. CAA does not provide travel funding for conference participants for the New York conference. We encourage all participants to seek out independent funding avenues through departmental travel funds or professional development grants.